Videos - Request your own! Sorry but this page is no longer in use. Please click here to go to our new Videos section where you can get cool Facebook Profile picture videos! Brand New - You can now get your name made into an amazingly cool video! Check out the previews below to see all the various styles! This is really cool... get your name rendered out in this amazing 3D video! Transformers - Your name in disguise! Get your name as this cool movie looking intro! 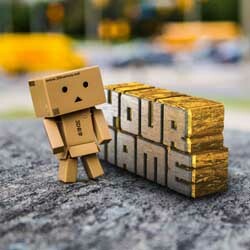 The original and most popular 3D Name style can be yours as an animated video with your name on it! Another 3D Name wallpaper converted into a video for you to request your name for! This one is cool... Get your name floating beautifully just under the surface of the water! Name Smash! That's right... smash your name, not once, not twice but three times! Oh yeah! A nice and pleasant little intro for your name! Let us know what you want and will be yours! Get your name floating in on a futuristic looking glass disc! A panning intro with your name being burned of the the mid air! Tssssst! Neon Glow! Rock the party with your name in this funky style! Your name epically floating down as if it's just arrived from the heavens themselves!